The Shah Rukh Khan incident at Newark International Airport over the weekend has elicited a range of viewpoints and opinions. Shah Rukh Khan, a famous Bollywood actor, was detained for over an hour, and interrogated by U.S. Customs and Borders Protection (CBP) authorities at Newark International Airport where he had landed. Mr. Khan believes that he was detained and interrogated because of his last name and his religious affiliation. The CBP (a part of the U.S. Department of Homeland Security) claims that officials were following standard protocol. Mr. Khan’s incident might be gaining international attention because he is a celebrity, but the truth is that ordinary American citizens and immigrants here in the United States grapple with racial and religious profiling routinely at airports. Especially since September 11th, 2001, South Asian, Arab American, Muslim and Sikh travelers have been subjected to arbitrary secondary inspections, detentions, and interrogations while traveling. Recently, the Asian Law Caucus and the Stanford Law School Immigrant Rights’ Clinic published a report that details incidents of intrusive questioning that many US citizens and legal permanent residents have faced when returning to the United States from trips abroad. The report provides information about the abuse of watchlists and first-hand accounts of profiling, as well as recommendations to safeguard civil rights. Racial and religious profiling must be eliminated whether it happens on the streets, on our highways, at borders, or at airports. Profiling people based on their last name, skin color, accent, or religious affiliation is an ineffective enforcement technique that violates civil rights protections. In fact, the use of profiling tactics has not been an effective law enforcement strategy in either the War on Drugs or the War on Terror. The Obama Administration and Congress have an opportunity to review and strengthen current administrative anti-profiling policies, and to pass federal legislation that bans profiling [the End Racial Profiling Act is set to be introduced in Congress again this year]. These are important steps in ensuring that the civil rights of everyone – whether a celebrity or ordinary American – are preserved. Deepa Iyer is Executive Director of South Asian Americans Leading Together (SAALT), a national, non-profit organization that addresses civil and immigrant rights issues. Learn more at www.saalt.org. It’s been five years since SAALT opened its first staffed office. We wanted to take this opportunity to reflect back on the past five years and look forward to many more. I’ll be putting up entries from SAALT staff and Board as well as past interns and staff. “Has it been five years already? When we opened our first office in New York City, just a few blocks from Penn Station, in a rented space at Citizens NYC, I was hopeful but unsure about what the first five years would hold. Thanks to the hard work and dedication of a number of people, including staff (current and former), Board members, interns, volunteers, and donors, we have been able to build a strong foundation for a national organization. When I started at SAALT five years ago, I was very sensitive to the model that we would create – how could we develop a national organization that would be informed by the experiences of people who were facing inequity on a daily basis? It took years of trust-building, conversations, a bit of struggle, flexibility, and faith for the National Coalition of South Asian Organizations to emerge, and for SAALT to have a meaningful presence at policy tables. On Tuesday, June 16th, SAALT’s Executive Director Deepa Iyer, along with NCSO partner Raksha, Indus Bar, the American Civil Liberties Union of Georgia, and Khabar, launched the One Community United campaign with an inaugural town hall in Atlanta. The event was the first in a series of community forums to be held throughout the country as part of the campaign. The town hall took place at the Global Mall in Atlanta on Tuesday evening, and about forty people attended the event. The group was very diverse, including representatives of South Asian organizations, local students and community members, and members of local places of worship. The heart of the discussion was immigration and human rights. From the very beginning, participants eagerly engaged in the discussion, addressing issues ranging from the rights of immigrant workers, to detention and deportation, to the reunification of families. Participants also discussed how the human rights of immigrants are often violated in this country. The event closed with a call to action, encouraging participants to contact their representatives in Congress, stay in touch with organizations working with the South Asian community, and stay up to date on immigration issues. Many who attended walked away feeling inspired to take action on immigration reform in their communities. Vandana said, “The town hall was extremely eye-opening and thought provoking… I am going to chalk-out a plan of action… and definitely contact some people that I know will share the same enthusiasm for the [Be the Change] project.” Noshin, a representative of Refugee Resettlement and Immigration Services of Atlanta, said he would “keep up with bills introduced and contact [his] representatives “ and “share [his] immigration story with SAALT.” Many others expressed a strong desire to go back to their communities and address the issues discussed at the town hall. SAALT left the event looking forward to future town halls, to be hosted in the San Francisco Bay Area, Chicago, New Jersey, and Washington DC. It was great to see so many Atlanta community members coming together to express their support for immigration reform. Overall, the event was a very exciting kick-off for SAALT’s One Community United campaign. 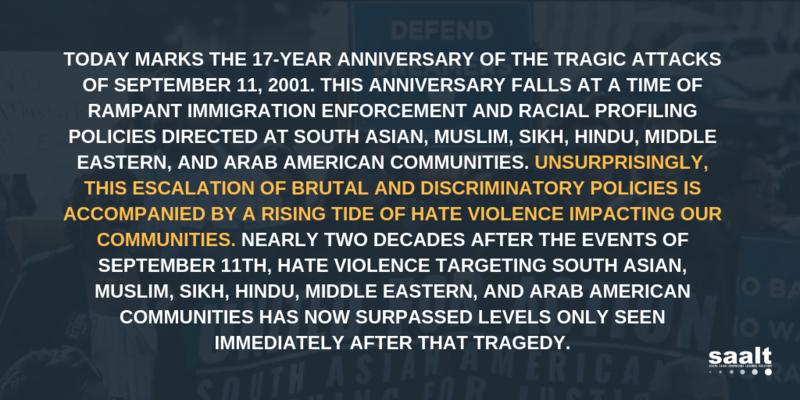 For more information about the One Community United campaign for Civil and Immigrant Rights, visit here <http://www.saalt.org/pages/One-Community-United-Campaign.html>. I’m lucky to be interning at the American Civil Liberties Union (ACLU) of Georgia this summer and was grateful to be a part of the SAALT/ACLU forum. After attending the Immigration Forum, my perspective has been enlightened and truly widened. Immigration is a hot topic in today’s world – tell me something I don’t know. But how it affects the actual immigrants is truly the issue at hand. I’ve heard accounts of the trials and tribulations that so many people have had to go through in order to get a better start in this world, and my heart goes out to them. The forum itself not only provided more information to the uninformed, but allowed for a healthy and knowledgeable discussion for both the informed and uninformed. It’s so important to stand up for what is right and immigration rights are, in essence, human rights. What knowing individual wouldn’t stand up for human rights? So, I suppose the more important question is, what can we do about it? Well, really, everyone who was able to make it to the forum has already taken the first step – stay informed. It’s as simple as that. You can make a difference by staying informed, whether that’s catching up on the current issues on Google News, or joining a human rights advocacy group (GA Detention Watch, Human Rights Atlanta, Raksha, SAALT, etc.). The more allies we have, the bigger the impact we can have – not to mention strategic pull. So, take ten minutes a day to read what’s going on in the human rights/immigration front and from there, I swear, it will be plenty easy to get involved! Hear about the 2009 National South Asian Summit from the Attendees Themselves! During the Summit, SAALT staff and interns used our handy Flip cameras to hear from attendees about their experiences. We’re are currently in the process of posting these clips on our YouTube channel. Hear what Summit participants learned, what they hope to bring back to their communities and more!